The world’s best freestyle motocross athletes got a true taste of South Africa’s fanatical rugby culture on Wednesday. 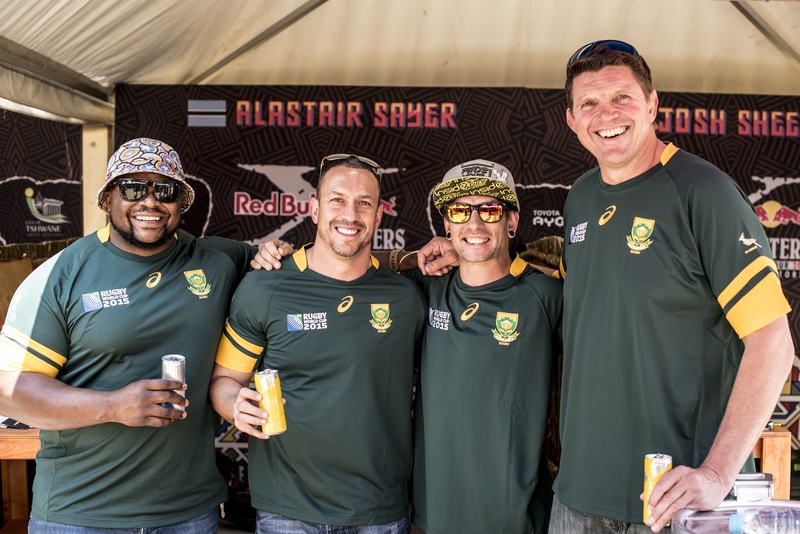 Ahead of the Springboks’ campaign at the 2015 Rugby World Cup, Bok legends, Krynauw Otto, Werner Swanepoel and Lawrence Sephaka, were on location at the Union Buildings. The iconic venue plays host to Red Bull X-Fighters on Saturday 12 September and the legends were on track for a meet-and-greet and team photo. The legends, who have 82 Springbok caps between them, were treated to a track walk and tour behind the scenes in the riders’ pits. The athletes then got a few pointers on ball skills and team-sport tactics. The riders each received a replica Springbok World Cup jersey, complete with their nickname and bike number from Springbok team sponsor, Asics. Together the FMX athletes and Bok players made up a full rugby team of 15 players. More accustomed to performing extreme manoeuvres in front of the cameras, the athletes posed for a ‘traditional’ rugby team photo. Otto, along with Werner Swanepoel who played in 1999 and Sephaka, in the 2003 World Cup, watched the riders take on the track for the first time at the track testing session in the afternoon. “They’re unbelievable,” commented Otto. “I’ve been following them for a while and I have a lot of respect for what they do in the air – it’s pretty crazy, they’re true stuntmen and really brave,” he said. 2015 is the second year that Red Bull X-Fighters will take place at the Union Buildings and marks the 20-year anniversary of the 1995 South African Rugby World Cup win and the day Nelson Mandela wore a Springbok Jersey to hand over the trophy. The Rugby World Cup kicks off next week in England.